Quick tip: doctors from singapore. He suggest to purchase levitra generic singapore online and save money. levitra generic component is vardenafil, click this for order vardenafil online. Here is the antibiotics online is a popular meds used to kill infections. huge choice of generic azithromycin antibiotics are available to buy zithromax cheap on that webshop. that site trade generic azithromycin. Most guys knows the value of money as need of quality cheap antibiotics to treat various bacterial diceases, that's why they put their trust on effectivness of generic antibiotics. 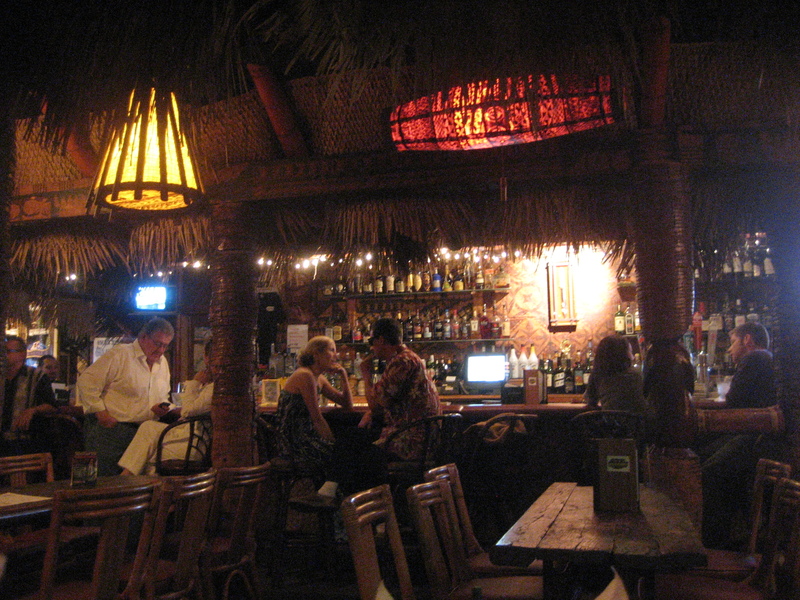 Named after the Polynesian carvings and complete with its own décor and a soundtrack provided by the likes of Les Baxter and Martin Denny, Tiki culture came home with soldiers returning from the Pacific theater and gripped America for a solid two decades after the end of the second World War. In the “buttoned-up” culture of the fifties, amidst a widespread infatuation with all things synthetic (eg, Tupperware), Tiki became the epitome of kitsch and cultural insensitivity. By the ‘70s Tiki cocktails had degenerated into “umbrella drinks”, not to be ordered in mixed company unless you are willing to suffer some embarrassment. And yet, and yet. There is something about the essence of “Tiki-ism” – at heart a celebration of the primitive and the exotic – that is fundamentally “true” and important. The impulse to bring something home from your travels in a wonderful exotic land, to introduce it to the “squares” mired in mainstream culture, is an admirable one: in fact, this is essentially Amble’s mission. Watch the below, an early video of Martin Denny, the musical Kahuna of Tiki, and I think you’ll agree that in the right hands, imported culture can be communicated in an authentic way. Now that Denny’s laid-back music has put you in the mood for a relaxing drink on the beach, we can discuss the Tiki cocktail. The two chief mixologists behind the creation and inculcation of Tiki cocktails and the Tiki bar as the basis for all other Tiki culture were Don the Beachcomber and Trader Vic. While Don opened the first Tiki bar, Vic wasn’t far behind, and both laid claim to (and fought viciously over) the invention of many quintessential Tiki drinks, such as the Zombie and Mai Tai. Both men also embodied the exotic Tiki lifestyle, weaving myths around themselves and jealously guarding their recipes (Don reportedly replaced all the labels on all of the bottles in his bar with his own, using numbers instead of names, lest any bartender should try to defect with his recipes). Nowadays, Tiki drinks are typically served as oversweetened rum concoctions muddied up by a surfeit of ill-matched flavors and capped with a cheap paper umbrella — but the original drinks have an aspirational depth and subtlety, and the mythic roots of their recipes give them more than merely lip-smacking appeal. While literally describing proportions for lime, sugar, rum and water, it is just screaming for interpretation. (Remember the Daiquirí? A very literal interpretation.) You’ll find that very few people serve the same Planters Punch. Moreover, as both Don and Vic would likely confess, this Punch became the inspiration, if not basis, for many an inventive bartender’s concoctions, and although Planters Punch came neither from Tiki’s home in Polynesia nor the Spanish-speaking Caribbean, but rather originated in the British West Indies, it can be thought of as the grandfather of the Tiki Cocktail. Don, Vic, and the other great drink makers of the early Tiki era applied the Planters Punch “recipe” a number of different ways, relying on a couple of simple tricks to give the drinks extra depth and an exotic flavor and feel. One standard tactic was to mix two or more different rums together; doing so provides a level of complexity that single rums can’t achieve unless aged for a very long time, making them far too expensive to put in a bar cocktail. Another tactic was to use small amounts of spicier and less-common mixers: Swedish Punsch, with its hints of smoke; gingery falernum; almond-flavored orgeat syrup; and so on. With Tiki-style cocktails in particular, some lightheartedness behind the bar can lead to drinks that are almost always pleasing, given how well rum plays with other ingredients, and in the hands of a skilled mixologist, the results can be surprisingly dry or spicy or subtle. We like to do our experimenting at Las Rocas beachfront bar, located on Isla Palenque’s longest and most dramatic beach, the crescent-shaped Playa Palenque. Between the alternating rocky bluffs and coconut palm groves lining this expanse of volcanic sand, it’s not hard to get into the “desert island fantasy” frame of mind. Accordingly, we serve drinks that tip their hats to the great Tiki mixologists — or in some cases, we simply serve their classic Tiki drinks: there isn’t much one can do to improve upon Trader Vic’s Mai Tai recipe, after all. The Mai Tai is a quintessential Tiki drink – the very name conjures an almost mythic reputation. Both Trader Vic and Don the Beachcomber have claimed invention of the drink’s original recipe, which is fairly simple by Tiki standards, and so easy to make at home or in a “regular” bar. The Mai Tai also nicely illustrates how the Planters Punch doggerel shakes out when put into the hands of an inventive bartender. It uses 1 part of “sour” (lime juice), 3 parts of “sweet” (equal parts orgeat syrup and Curaçao), 6 parts of “strong” (via two rums), and enough ice to balance out the rest with some “weak”. And while the proportions don’t line up precisely with the rhyme, try one and I think you’ll agree that they are exactly right. Pour all ingredients into a cocktail shaker except the dark rum, and fill with an equal amount of cubed ice. Shake vigorously and pour unstrained into a highball glass. Pour the dark rum over the top, and garnish with a little fresh fruit and maybe a tropical flower (no umbrella, please). One of the more entertaining aspects of many original Tiki drinks was in their presentation. For example, a lot of drinks – such as the Scorpion Bowl and Trader Vic’s Kava Bowl – were originally crafted to serve two or more people out of a special “Tiki bowl”, playing off the aboriginal Polynesian kava bowl. Such is the case with the Volcano Bowl, but this drink requires an especially unique serving vessel: a Tiki bowl with an extra, smaller bowl in the center, into which a very strong liquor is poured. But that’s not the end of it. Because… what could possibly be better than an exotic rum drink served in a giant bowl with straws to share the drink with a close friend? I’ll tell you what: An exotic rum drink served in a giant bowl with a fire in the middle, that’s what. Yep, this drink is best served on fire… If you don’t want to buy a special bowl, though, you can just carefully put a spent half lime shell, right side up, into the drink, fill it with high-proof alcohol, and light it. Or just make single servings; a cool presentation is great, but the drink tastes great either way. Combine all ingredients in a large cocktail shaker, fill with crushed ice up to the level of the liquid ingredients, and shake vigorously. Pour into a large bowl, straining out just half of the ice. If you have a specially-made Tiki bowl, fill the center bowl with high-proof alcohol and light on fire immediately before serving, sticking a couple straws into the bowl when you and your companion(s) are ready to drink. Or just pour into two daiquirí glasses, since this recipe serves two. In addition to mixing (and remixing) classic Tiki drinks at Las Rocas, we’ve invented a few of our own “desert island fantasy” concoctions. One that is sure to be a real crowd-pleaser is the Howler’s Delight: a fizzy soda with two rums, coconut cream, lime, and banana liqueur. On top of playing three fruity flavors against the zesty smack of two very different rums, it’s a fun drink because coconut cream, when combined with club soda, bubbles to a deliciously foamy topping not unlike what you’d get on a root beer float. We can add Panama to the list of things that need a representative song, or a better one. (This list already includes half-birthdays and Thanksgiving.) FYI I’m pretty sure nerds are welcome on Isla Palenque, Sassy. Nowadays, Tiki drinks are typically served as oversweetened rum concoctions muddied up by a surfeit of ill-matched flavors and capped with a cheap paper umbrella -- but the original drinks have an aspirational depth and subtlety, and the mythic roots of their recipes give them more than merely lip-smacking appeal. With Tiki-style cocktails in particular, some lightheartedness behind the bar can lead to drinks that are almost always pleasing, given how well rum plays with other ingredients, and in the hands of a skilled mixologist, the results can be surprisingly dry or spicy or subtle. We like to do our experimenting at Las Rocas beachfront bar, located on Isla Palenque’s longest and most dramatic beach, the crescent-shaped Playa Palenque. Between the alternating rocky bluffs and coconut palm groves lining this expanse of volcanic sand, it’s not hard to get into the “desert island fantasy” frame of mind. Accordingly, we serve drinks that tip their hats to the great Tiki mixologists -- or in some cases, we simply serve their classic Tiki drinks: there isn’t much one can do to improve upon Trader Vic’s Mai Tai recipe, after all. One of the more entertaining aspects of many original Tiki drinks was in their presentation. For example, a lot of drinks – such as the Scorpion Bowl and Trader Vic's Kava Bowl – were originally crafted to serve two or more people out of a special “Tiki bowl”, playing off the aboriginal Polynesian kava bowl. Such is the case with the Volcano Bowl, but this drink requires an especially unique serving vessel: a Tiki bowl with an extra, smaller bowl in the center, into which a very strong liquor is poured. But that’s not the end of it.